During his completion of the 5 Oceans (a marathon swim in the Atlantic, Arctic, Southern, Indian and Pacific Oceans), recent International Marathon Swimming Hall of Fame inductee (Honour Swimmer) Lewis Pugh had to study and carefully prepare for various creatures that could be of potential harm to him and his crew. Below are 10 of the most potentially dangerous creatures in the open water for swimmers, depending on where they swim - and there is one special mention. Found in the Arctic. They look cute, but they are extremely dangerous. They are one of the few animal species that will hunt a human. They do not fear man and can move very quickly. Found in many rivers and lakes in Africa. They are patient. They wait. They are ambush predators. It is difficult to see them - because most rivers and lakes are murky. 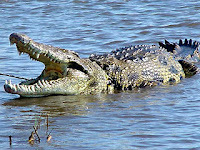 Not many people survive a crocodile attack. They kill more people in Africa than any other animal, other than the mosquito (malaria). A bite from a hippo is a serious wound. They are frightening looking animals with razor sharp teeth found off the Antarctic continent. They bark a blood curdling hiss when swimmers get near. One moment they will kill a penguin and drop it in front of a swimmer as a gift. The next moment they are trying to bite human legs. A well-known apex predator found in most oceans is very dangerous, but a surprising number of people survive great white attacks. Some species are among the most venomous creatures in the world and are found off the Australian coast, but they are invading other waters around the world. A sting can be fatal. They can handle themselves well against the Great White Shark. Enough said. Air-breathing aquatic snakes have some of the most potent venom of all snakes. Some have gentle dispositions and bite only when provoked, but others are much more aggressive and teeth may remain in the wound. Known for their sharp teeth and a voracious appetite for meat, the total number of piranha species is unknown with estimates ranging from fewer than 30 to more than 60. Many open water swimmers are hit by boaters, windsurfers, surfers and Jetskiers or have had near misses. 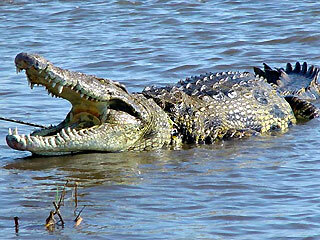 There are other predators and creatures for open water swimmers to be cautious of, without a doubt. However, humans are visitors in the marine world where its natural denizens must be respected and protected.